Muscletech Whey Premium is a high quality whey protein supplement which will give you 20gms of protein per serving in a 32.7 gms serving size. Muscletech whey Premium protein helps to increase your body strength and stamina. This protein supplement will help to reduce the unhealthy weight. Muscletech premium whey protein nutrition will provide you surplus energy throughout the day or after a heavy workout. It is equipped with Bcaa and Glutamine which helps to support and create a good environment in body to growth your muscles and weight gain. This whey protein supplement will give you 20gms of pure protein with enrich formula which will refuel your muscle with energy. Muscletech Whey Premium is a rich nutritional supplement containing whey protein concentrates isolates and hydrolysates with a recovery blend of creatine, amino acids and glutamine to reduce your post-workout fatigue. Also, there is no sugar added in this whey protein. It is made of sucralose, a natural sweetener with no carbohydrates and sugar. We all know, milk and egg are natural source of protein. But taking whole food as primary protein source is good if you don’t have expectation in terms of growing your muscle size Fast. Milk is a good option but you have to wait longer time to see the good results. Whey Protein supplements are good source of protein and it can give you good results. Normally Whey Protein is the byproduct during cheese production. 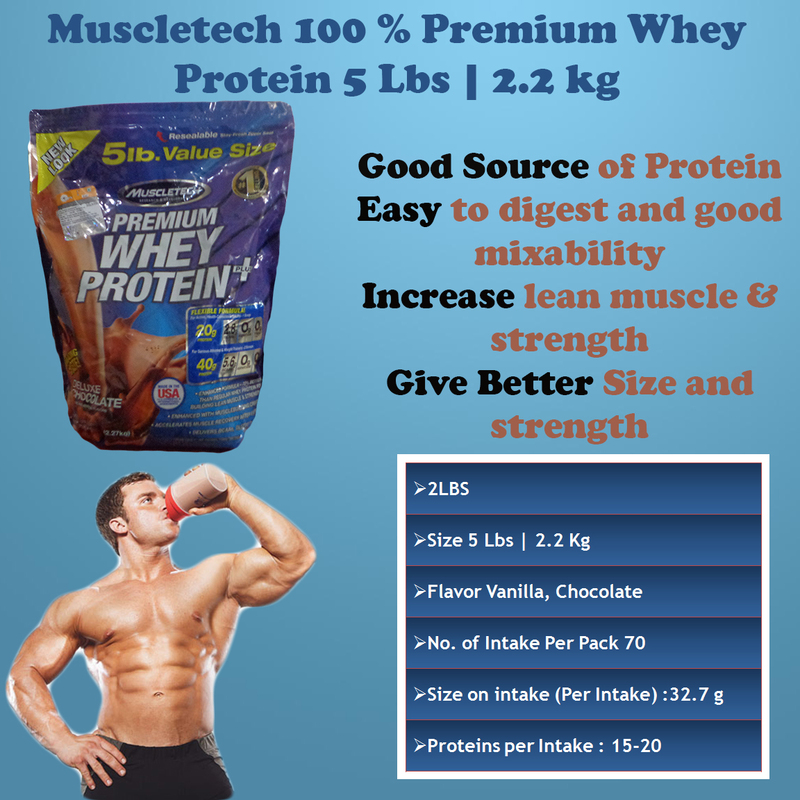 Whey protein is considered as best source of protein and gives best results. Whey Protein is easily digested and considered as fast acting protein source. Whey Protein is equipped with Es¬sential Amino Acids (EAAs)–including the three Branched Chain Amino Acids (BCAAs), and they contain subcomponents (microfractions) that appear to provide benefits above and beyond amino acids and elemental nitrogen. Reduce Fats : A study done on subjects for 12 weeks shows that subject who used the whey protein burn more calories. Study is done for 12 weeks on two groups. One group is putted on specialized whey fraction (Prolibra™, high in leucine, bioactive peptides and milk calcium). After 12 weeks study results shows that subject who used Prolibra burn more calories. Give Better Size and Strength: Study done for 10 weeks with 14 grams of whey and casein protein along with 6 grams of free amino acids on resistance training athletes. Athletes putted on resistance training and whey protein supplement before and after exercise. After analyzing the data it is found that athletes got better results in terms of fat free mass and muscle strength. Control Hunger: Group of Australian reaches done a study on different mans putting on different drinks. Those who used whey protein drinks reduce the amount of ghrelin hormone. Ghrelin hormone transfer signals to mind that your stomach is empty. WPI is considered as most pure form of protein. It contains ~ 95% of pure protein. It is good source of protein which contains less amount of lactose. As it is purest form of protein and required more fine flirtation process. Whey Protein Hydrolyzed: With improved process, long protein chains are broken into small protein chain known as peptides. This type of proteins is easy to digest and gives better results. It contains around 80-90 % of whey Protein. Casein Proteins: We know that 80% of protein in milk is Casein. Casein protein as considered as slows acting protein and digesting process is slow as compare as other protein. It is recommended to take Casein Protein at bedtime. Egg Protein: Eggs are good source of protein. Egg proteins are equipped with Essential Amino Acids which helps in muscles tissues recovery. Egg proteins are also easy to digest and will give you best results. It is considered as lactose free protein source. If you’ll get benefits of slow, fast and intermediate protein together in single protein health supplements.This type of protein will give you best protein. Blended proteins give you more sustained protein digestion than single-source pro¬teins like whey, casein, or egg. It is study which shows that taking whey protein shake before 1 hour of workout will give you better results. If the Essential Amino acids and BCCA are the parts of protein shake then it will helps in recovering muscle tissues faster. Egg Protein will be suitable option as pre workout supplement as it contains amino acid and it is easy to digest. Post Workout: Post workout time is very important. If you take proper supplement after 30-60 min of workout then you can significantly improve the results and performance. Enzymes and hor¬mones are actively repairing and rebuilding ex¬ercise-induced damage as well as replenishing glycogen stores, so your muscles are especially receptive to nutrients. By supplying a post-workout recovery protein containing whey, ca¬sein, egg, and simple carbohydrates during this “window” of opportunity. BEFORE BED: Prepare your body for the long fast ahead with a casein protein shake a half an hour before bed. Unlike whey which is rap¬idly broken down in the gut, casein is digested at a much slower rate releasing its amino acid constituents over several hours throughout the night while you sleep.